Walking an hour each way to school is an every day occurrence for three of our students. These brothers hike daily through some treacherous urban terrain, yet always manage to look clean and ready for the day. Schneider and Jovany are in 10th and 7th grade respectively, and their younger brother, Sebastien, is in the 1st grade. They travel such a long way because the Three Angels Christian Academy is the only one they can afford to attend, and education is simply that important to their future. We recently had the honor of being invited to their home. Schneider met us after school one day so we could join him on his trek home. He helped us navigate an area called Le Valle de Bourdons, a community with vendors and tarp homes stacked on either side of the steep valley which is bisected by a shallow river. The area is dense with people, and we switch-backed through narrow alleys down the hill and back up again. It had rained earlier that day, so the paths were muddy and slippery. Schneider easily hopped over divots and onto sandbags, finding footholds and weaving through passageways like he could do it in the dark (and he does.) The only thing slowing him down was us Blans trying to follow him. When we arrived at his home, his mom, Allemagne, greeted us with a smile and hugs as we caught our breath. We have known Allemagne for many years. We first met her in 2006 as an unemployed single mom with five kids to feed. She had relinquished her two daughters out of desperation and fear. She still has a tattered plastic photo album holding pictures of her girls who were given up for adoption. In order to keep the remaining children with their mother, we made sure her three sons were enrolled at Three Angels and quickly found sponsors for them. Being invited to their home was a very big deal for us and for the family. Allemagne proudly told us that her eldest son, Schneider, built their home for them a few years ago. He is only 16, yet serves as the man of the house. The home is a mix of tarps, sticks and sandbags with a plywood door. The ‘kitchen’ is a shelf carved into the hillside where the home is perched. Jovany and Sebastien showed us the one bed they shared with their mom. Schneider sleeps on a mat on the dirt floor. As we talked, Allemagne showed us the pot of cornmeal porridge she was preparing for dinner. This was to be their only meal of the day. She had lost her job as a laundry washer last November, so I asked her how she was able to procure cornmeal and the coal to cook it with. She just shrugged and explained that people share what they can when they can with her. Clearly, in a neighborhood full of Allemagnes, there must be a very high level of true community. 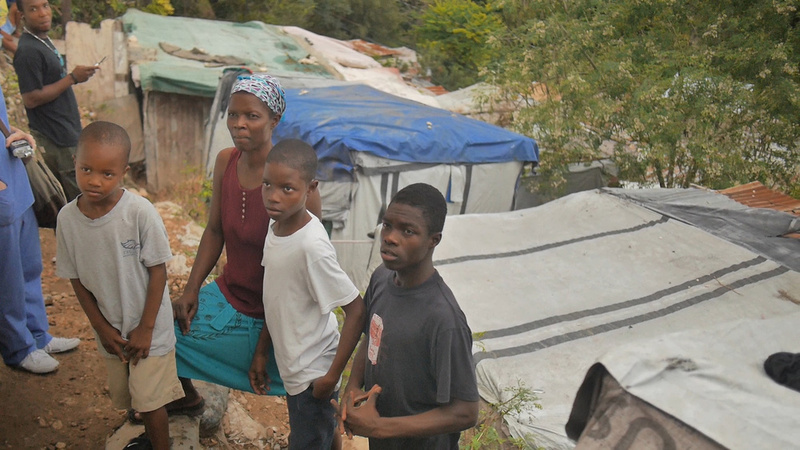 Basic necessities like food, water and power feel like luxuries to this family. There simply is no electricity on this hillside. Homework must be done before dark. Water is for sale about halfway down the hill. But when there is no money, they hike down to the fetid river to bathe and wash their clothes. There was no end to the remarkable things that were observed and no end to the questions that came up. How do you feed a family of four with no income? How do they find their way through this maze in the dark? How do the boys do homework with no desk and no light? How much rain can that home withstand? How do they manage to all be so fastidiously clean? Where do they keep the few valuables they have -- the laminated photos, the ID cards and the report cards? What was certain was just how difficult our students’ home lives can be. 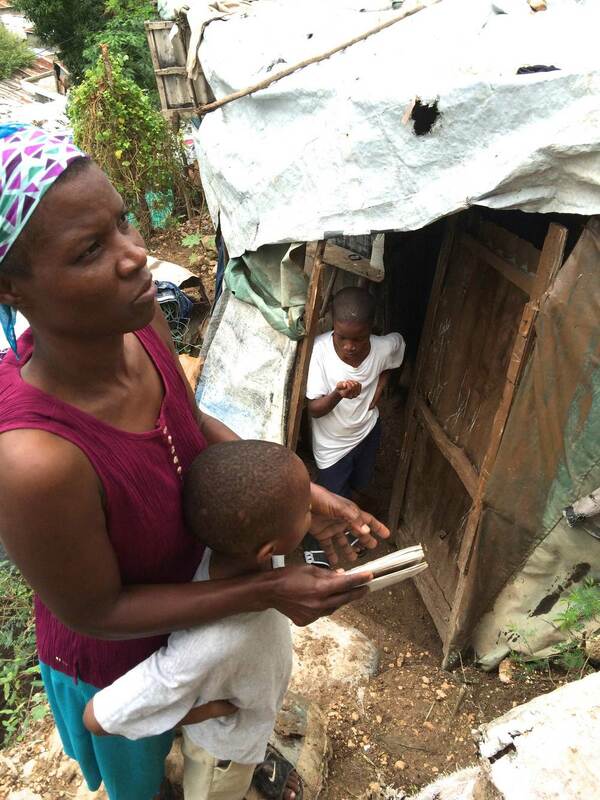 Yet the resiliency and resourcefulness of these families is frankly astounding. What was also revealed was that, even among the poor, there are social striations. Sebastien and Jovany do not tell anyone at school that they live in Le Vallee de Bourdons; there is shame in it. They do not socialize with friends outside of school so that it is not discovered. It was also apparent that at some point a single mom with limited literacy soon becomes dependent upon her educated children. The future of this family rests on the back of these young boys, and we are honored to join them in this long walk. 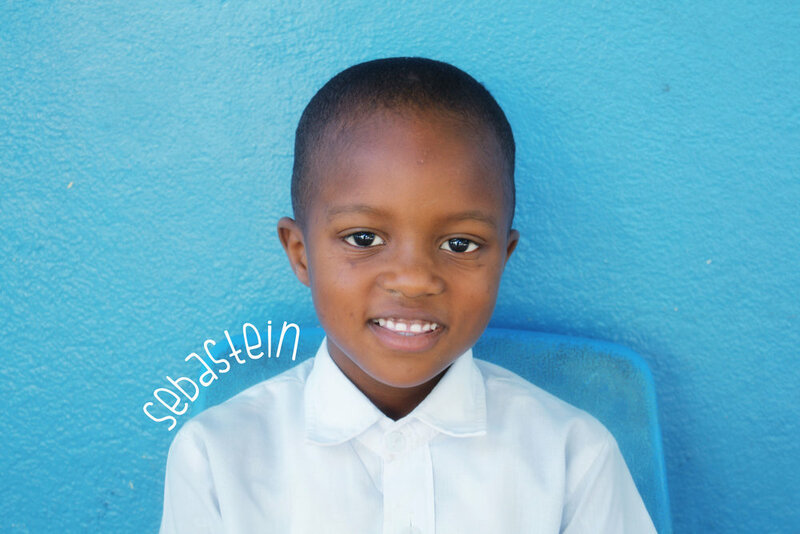 Schneider, Jovany and Sebastien attend the Three Angels School because of the generosity of our Student Sponsors. 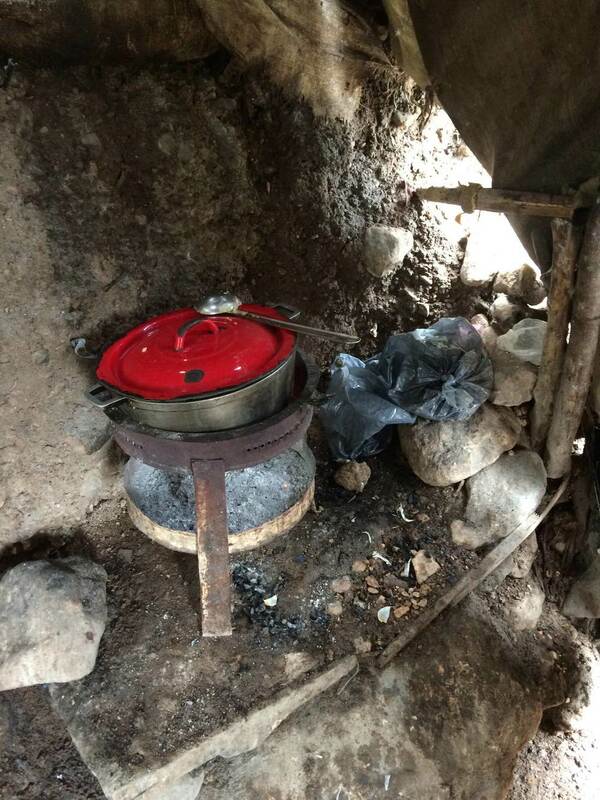 They receive an education, job training, medical care and a hot meal every day. To offer this to one of our students, please visit our Sponsorship page.